We're running a bit late with today's message and that's because one of the best tipsters online has some free tips to give away but I'm not allowed to tell you before 12:00. 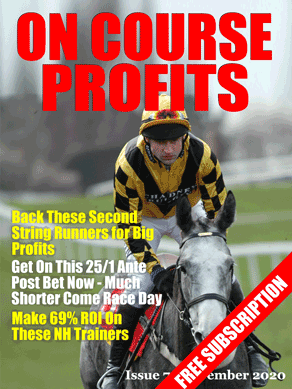 If you haven't heard of Nicky Doyle he's a hot shot Irish tipster who tips for the big races both sides of the water. He tops the tipster proofing tables at Race Advisor with Betfair SP profit of 123 points and 177 points profit at advised prices. Nicky is getting ready for Cheltenham and would like to give you his selections for a big priced Cheltenham Yankee. To get these selections as well as free tips for the Saturday big race every week. And these free Saturday tips have proven to be highly profitable with 150 points made in 2014. To get these free goodies just Click Here and register your email address. Today a reminder of the recent article by Mark Foley of Betting School Insiders. You no doubt recall that Mark highlighted that Gordon Elliott does very well with the horses he ferries over to Perth and that so far this year if you just backed all of the Elliott horses that run at Perth you would have made a tidy SP profit. Today Elliott has 7 runners, two in the 15:00, they all have chances and are all trading towards the head of their markets.